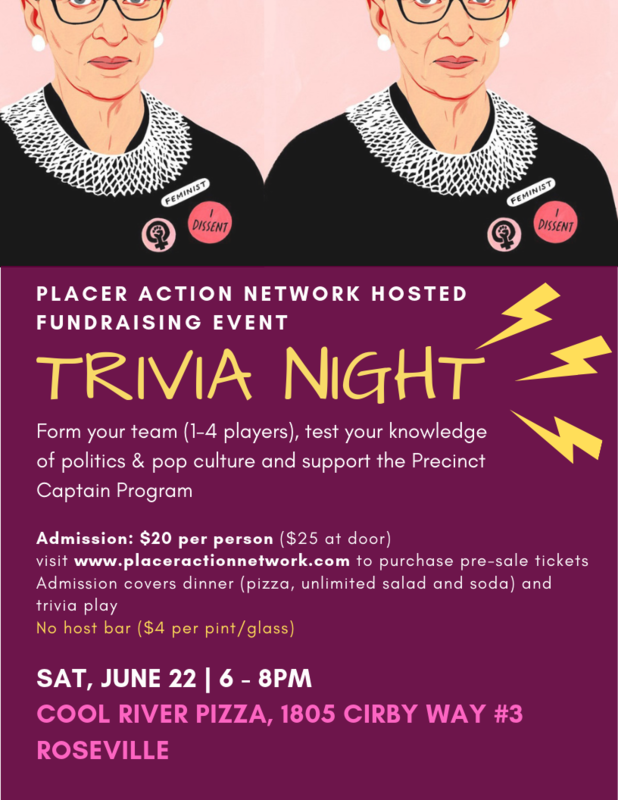 Join Placer Action Network for its inaugural Trivia Night fundraiser benefiting the Precinct Captain Program (PCP) on Sat, June 22 (6-8pm) at Cool River Pizza in Roseville. Invite your club friends or bring some new friends to form a team (1-4 people) and enjoy a night of dinner and trivia. “celebrity” hosts to walk us through the evening. You will also have the opportunity to put in a few bids on our silent auction baskets! Admission—$20 per person ($25 at the door) includes dinner of pizza, unlimited salad and soda. A no host bar (wine/beer/cider) is available for $4 per serving. 75 people so register early to reserve your spot now!